Standing room only at a Congressional hearing on Asian carp at the Lyon County Convention Center. 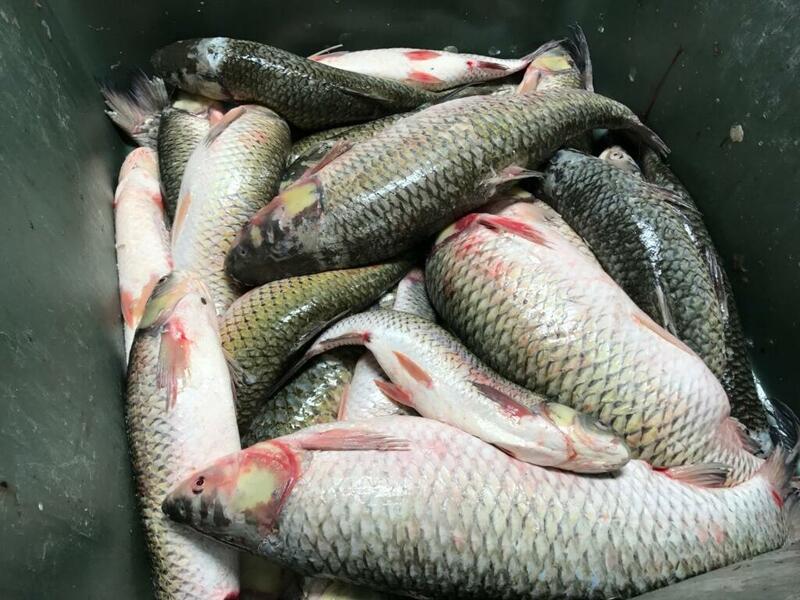 A congressional hearing on the growing problem of invasive Asian Carp in Kentucky and Tennessee waterways drew a crowd of more than 375 people at the Lyon County Convention Center Friday afternoon. As the event began, community participants continued to stagger into the hearing, lining the walls due to witness a panel provide testimony to Congressional First District Representative James Comer. Asian carp “threaten direct havoc on our aquatic environments,” Comer said. He lifted a notebook that he said contained “hundreds” of letters from constituents that had written to his office about the pervasive fish. Comer said the letters indicated that not only do Asian carp threaten the economic prosperity that professional fishing tournaments bring to the region each year, but they pose a safety risk as well. “A bow fisher even wrote to me that she suffered a broken nose after she was hit by a silver carp.” Comer said the community has sent a clear message: that Asian carp are inflicting serious damage on local tourism, threatening hotels and numerous other small businesses. Comer said several solutions had been offered to eradicate the fish from the letters. Constituents asked the federal government to support commercial fishing by subsidizing carp prices on the market, to providing grants to put in place infrastructure to transport the fish and funding for equipment to buy the gear required to operate boats and nets to catch them for harvest. Comer said other letters suggested bow and net fishing tournaments for mass harvests of the fish; as well as introducing natural predators or chemical methods of control to help eradicate the invasive species. Professional angler Mark Menendez of Paducah gave a passionate speech before the panel began, pleading for immediate action from the audience to call upon their representatives to mitigate future damages. “We have the most navigable waterways in the lower 48 [states] so we have the most to lose,” Menendez said. Menendez said in his 27 years of travel as an angler he has encountered numerous invasive species that mother nature has managed to correct, but that hasn’t been the case for Asian carp. “So it is up to us to come together and this is one time that man’s intervention on the ecological system will be a positive to find a way to control this species so it doesn’t push out our game species,” Menendez said. Allen Brown from the U.S. Fish and Wildlife Service, Mark Gaikowski from the U.S. Geological Survey, Ron Brooks from the Kentucky Department of Fish and Wildlife, Randy Newcomb from the Kentucky Lake and Visitors Bureau and Bobby Wilson from the Tennessee Wildlife Resource Agency shared their concerns and offered solutions based off their experience with the invasive species. “Here in Kentucky, the Service is working collaboratively with its federal and state partners to implement strategic detection, prevention, and control actions to reduce the risk from Asian carp populations in the Ohio, Tennessee, and Cumberland rivers, ” said Allen Brown. Ron Brooks said those collaborative efforts need immediate federal funding. “There was a huge 2015 year class that is now becoming young adults and so the emergency of this issue is just being exemplified by that fact and the timing could not be more perfect in getting funding to help us with this issue.” Brooks said. Brooks said, right now, there isn’t enough financial incentive for commercial fisherman to catch the fish. The current market price for Asian carp runs about 17 cent per pound. Brooks said the state subsidizes that price another five cents, but it needs to reach 25 cent per pound before it can be worthwhile for fisherman. He asked Comer to consider that as an option. Locally, he said commercial fisherman could harvest around nine million pounds per year and satisfy current markets. “I know we have been contacted by an outfit out of New York, that has an ethnic market there. They’ve ask for 30 million pounds. That alone would get us started to where by the time we got ramped up and could take care of those, we would be ready for more markets in hand,” Brooks said. Professional angler Mark Menendez of Paducah asked the room to call their local representatives to help find solutions to control Asian carp. Mark Gaikowski, of the USGS, agreed that harvesting the fish is one part of the puzzle, but science could be another. By 2019, the USGS, along with US Fish and Wildlife, the Army Corp of Engineers and the University of Minnesota, Fish and Guidance Systems plan to implement a bioacoustical fish fence at Barkley Lock and Dam. The $2.5 million project will be monitored for three years. Gaikowski told WKMS that commercial fishing and acoustic deterrent approach the Asian carp problem from two different angles. “Commercial fishing is removing the adult fish from the population. The acoustic deterrent is stopping the fish from moving into or continuing to expand into a system,” Gaikowski said. “If you integrate commercial fishing and remove the adults and also incorporate a deterrent system or barriers to the fish movement you have different slices at that overall population,” he said. Kentucky Lake Convention and Visitors Bureau Executive Director Randy Newcomb said that Asian carp has diminished the region’s status as a world-class Bass and Crappie fishing tournament destination. “Tourism in Kentucky generates an economic impact of $15 billion dollars annually,” Newcomb said. In the western lakes and rivers region, which is a 15 county region around Kentucky and Barkley lakes, Newcomb said tourism generates around $1 billion each year and supports 12,000 Kentucky jobs. Newcomb said that Fishing League Worldwide holds more than 300 bass tournaments around the world. This year 17 of those were held in Kentucky with eleven of them on Kentucky Lake and Lake Barkley. Officials are struggling to contain invasive Asian Carp. “I think a natural predator would be a good fit for Asian carp, unfortunately I don’t think once you get 30-50 pound Silver Carp that is going to eat that,” Allen Brown said. In addition, USGS’ Mark Gaikowski said that the irregular breeding patterns of Asian carp puts the fish out of sync with some of the native predators. Gaikowski said there is an active research project that looks at the use of chemical controls to mitigate Asian carp, and a field trial is scheduled for this August in Iowa. He said discussions on how to move forward with genetic or synthetic biology controls is also an active discussion. Audience members shouted in support of the method of synthetic and biological controls. Bill Chumbler of Eddyville was one of those supportive voices. Chumbler said he is for chemical injections or genetic modification because he doesn’t believe any one solution will be enough. “There is just so many in here I just can't see harvesting that many,” he said. Another audience member and avid outdoorsman, Eddie Joiner of Grand Rivers, said he was glad to see so many turn out in support of the regions ecological resources. “Hunting is my life. And anything that involves the outdoors - preserving or conserving it,” is important, said Joiner. “I've got a granddaughter and she likes to fish and so I like seeing Congress having open meetings to see what the wildlife resources mean to people and I think the crowd and the audience today spoke a good message,” He said. Joiner added that he believes in any control method as long as it doesn’t negatively impact other species. Mostly, he said he believes federal subsidies for commercial fishermen will provide immediate relief.